The U.S. Air Force – in a move so ridiculous it’s almost comical – has banned a yogurt which is sold in supermarkets across the country. The reason? 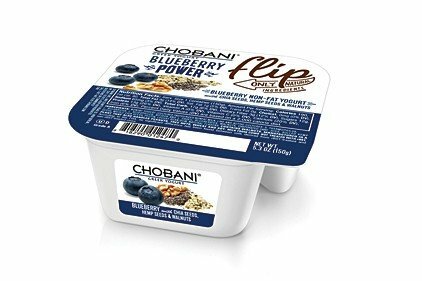 This particular yogurt (Blueberry Power Flip Chobani Greek yogurt) comes with a side of walnuts, chia, and that ever-controversial superfood: hemp seed. According to Captain Adam Koudelka, legal adviser for the Air Force Drug Testing Laboratory at the Air Force Medical Operations Agency at Lackland Air Force Base in Texas; “The Air Force has not restricted military members from consuming Chobani Greek yogurt; rather, only Chobani yogurt that contains hemp seed or hemp seed oil is prohibited, just as any product which contains or is derived from hemp seed or hemp seed oil is prohibited”. Captain Koudelka is referring to regulation AFI 44-120, paragraph 1.1.5, which strictly prohibits members of the Air Force from possessing or consuming any hemp related product, regardless of its legality. The reasoning is because of a fear that it will lead to failed drug tests; a fear which has no scientific merit. “Based upon the research we have conducted from the published literature available, the findings suggest that hemp food consumption is not likely to meet this threshold if THC levels in hemp oil and hulled seeds are maintained below 5 and 2 parts per million respectively,” says Jessica DiGennaro, spokeswoman for Chobani. This ban on hemp yogurt is a clear sign of how blindly the U.S. government and its entities cling to propaganda and outdated policies, going as far as banning a product which is legally available to civilians, simply because of misguided hysteria. It’s likely that one of the primary reasons that the Air Force continues to enforce these regulations is to control the opinion on hemp and cannabis among their soldiers. This move is similar to one made by the U.S. Army earlier this year, when they banned a legal vodka based on the fact that its made with hemp seeds. And yet, they can drink as much alcohol as they want. Easily; hemp-based foods would not offset an otherwise clean drug test. It’s not possible outside of gorging on hemp seed, and even then, a positive drug test result is still rather far-fetched. The Airforce is wrong though, and is instilling fear into its soldiers as well as the public because hemp seeds do not contain enough THC to cause a false positive. Not only do I know the science behind it but have taken weekly drug tests for the past year, due to a medical condition I have, and have not come up positive once, even though I eat hemp seeds daily in large amounts, much larger amounts than comes in Cobhani Greek Yogurt. It is really terrible that they are scaring people about arguably the most nutritious food on earth. And the most helpful resource we have. PAPER, CLOTHING, FUEL, FOOD, HOUSING, PLASTICS, OXYGEN, these are just a few examples of the items you can make with hemp. WOW! I wander if hemp milk is already banned too. They can put a ban on a nice healthy snack like hemp yogurt all while guarding poppy fields in 3rd world countries.While spraying toxic chemicals on the Coca leaves in Columbia turning the locals water and soil into into poison! What a bunch of chemtrail spraying, treasonous, waists of flesh. Get a clue you Air Heads!